Taco Journalism: Taqueria "La Canaria"
Taqueria La Canaria is located at the corner of 51st and Airport, right next to Casey's New Orleans Snowballs. I'd noticed this brightly colored taco wagon several times recently, and decided it was time to see what was up. Jarod and I ordered two tacos and a gordita each, with a variety of meaty fillings. The gentleman informed us it would take 10 minutes to make the gorditas, and we decided it was worth the wait to get some handmade gordy-love. 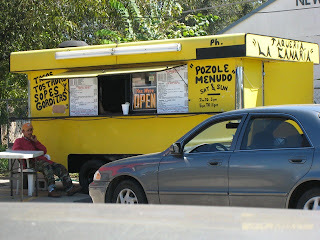 The thick, warm and tasty grilled corn exterior of the gorditas was indeed worth the wait, as it ended up being the highlight of the meal. 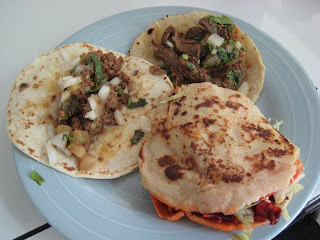 The regular corn and flour tortillas were pretty much run of the mill. Our food was served with two fairly weak salsas. The red was useless. It tasted like watered down Cholula. The green salsa was better, but was still a fairly unremarkable tomatillo salsa that was much less exciting than the jalapeno infused green sauces found at most of our favorite taco trucks. All of this could be forgiven if the meat was amazing, but, alas, it was not to be. All of the fillings we tried (picadillo, puerco guisada, fajita, al pastor) were ok, but far from amazing. Bland would be the word of the day. The fajita was fairly tasty, but was lacking the texture to make it excellent. I had high hopes for the puerco guisada, but the yummy looking red gravy did not send any taste waves to the ol' brainpan. Nothing was bad or approaching inedible, and there were no gross out moments. All in all, I'd say La Canaria is ok, which just doesn't cut it in a town with as many taco options as this one. In my opinion, this is by far one of the best places to eat! I loved it. I love fancy Mexican restaurants, but the food here is by far better than any fancy restaurant I have been to! Btw, the salsa was delicious and the food hit the spot!